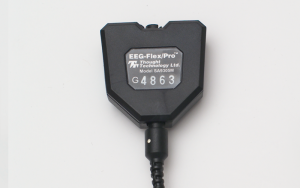 EEG is a pre-amplified electroencephalography sensor providing EEG from 2-1000 Hz with less than 0.3 μV noise. The EEG sensor is an electroencephalograph sensor, or pre-amplifier, for measuring the brain’s electrical activity from the surface of the scalp. It amplifies the small electrical voltages that are generated by brain cells (neurons) when they fire. Similarly to muscle fibers, neurons of different locations can fire at different rates. The frequencies most commonly looked at, for EEG, are between 1 and 40 Hz. The EEG sensor records a “raw” EEG signal, which is the constantly varying difference of potential between the positive and negative electrode, and the software usually processes that signal by applying a variety of digital filters to the recorded signal, in order to extract frequency-domain information. EEG signals are usually measured in microvolts (μV). Note: EEG practitioners call the negative electrode “reference” and the positive electrode “signal”. International 10-20 system for placement  is recommended. Skin preparation and use of adhesive, conductive gel is also most often recommended for best results. Skin preparation: For any recording where signal quality matters, good skin preparation is important to get a clean signal and avoid artifacts. Before applying the EEG electrodes, use a skin preparation cream, such as NuPrep. If necessary, shaving excess body hair may be required (see instructions below). Electrodes Selection: the DIN interface cable (T8740) allows any EEG electrode with 1.5 mm standard DIN connector to be connected to the EEG sensor. For single channel recordings, three (3) electrodes will be needed (one active, one reference and one ground). When recording multiple channels simultaneously, jumper cables such as SA9315-2 and SA9315-4 can be used to allow a single electrode to be used as a common reference and/or common ground. This reduces the number of electrodes needed. Most often silver-silver/chloride electrodes are used for best performance although many types of electrodes will work adequately (gold or tin, for example). Good Electrode Contact: Conductive gel is required for optimal electrode-skin contact. Make sure the electrodes are placed firmly on the skin and that there is good contact between skin and electrode (see instructions below). The electroencephalogram (EEG) is a recording of the electrical activity of the brain, most often captured at the surface of the scalp. The ten-twenty (10-20) electrode system of the International Federation  is the standard for electrode placement. It is used to place surface EEG electrodes in a repeatable way independent of inter-subject anatomical variability. It is called 10-20 because of the way distances between electrode sites are computed. The distances between certain anatomical landmarks are segmented at increments of 10% and 20% of their value, and electrodes are placed at these points. The letter Z is used to indicate the central line along the interhemispheric fissure. A number is used to indicate the position in reference to the central line (Z). The number value increases the further away the site is from the central line. For example, along the line joining sites A1 and A2: to the right of A1, at 10% of the overall A1-A2 distance is electrode site T3. This is followed by C3 (20% further), Cz (20% further), C4 (20% further), and T4 (20% further). Site T4 should fall 10% to the left of A2. For one channel EEG recordings, only one T8750 kit is required. Connect the blue active electrode to the blue DIN cable input. Connect the yellow ear clip to the yellow DIN cable input, and the black earclip to the black DIN cable input. The other end of the DIN cable plugs into the input of the EEG sensor. Note: For bipolar configuration, the yellow cup electrode is used in place of the yellow earclip. Proper site preparation and electrode placement are essential for clean, trouble-free recording of the EEG signal. The following steps describe how to achieve a secure connection in an efficient, repeatable way. They should be followed closely every time the EEG signal is recorded. This may seem daunting at first, but the technique is easily learned and the user will quickly become accustomed to it and will certainly appreciate the benefits. 1. Locate the required electrode sites. Locate the Inion. On the posterior base of the skull, where the spine meets the skull, there is a small protrusion called the “inion”. It can be found by running the finger up the spine towards the skull. There is a small crevice between the spine and skull in which vertebrae can no longer be felt. Just above that area, the inion of the skull can be found. Locate the nasion. The depression on the bridge of the nose, just below the brow and directly between both eyes, is called the “nasion”. The line between these two points runs along the interhemispheric fissure of the brain (the space that separates the left and right sides of the brain, i.e. right down the middle).Mark a spot located at 50% of the distance between the nasion and the inion. Locate the mandibular notch.Anatomy revisited: To locate the mandibular notch, place a finger against the tragus, just anterior to the ear, and ask the subject to open their mouth. Your finger should find its way into a cavity, resting superior to the manibular notch.Find this spot on both sides of the head. The line that connects the left and right mandibular arches runs along the central sulcus of the brain (the space that separates the frontal and parietal lobes). Mark a spot located at 50% of the distance between the left and right mandibular notches. It should intersect directly with the mark made between the front and back of the head. The intersection of these two lines is electrode location Cz. NOTE: Electrode location CZ can always be approximated instead of explicitly measured following the procedure described above. It is the top middle of the skull. Imagine if the subject were to hang perfectly straight from a string tied to the top of their heads, this is where the string would have to be fixed. Still, to ensure repeatable measurements, especially when comparing across sessions, it is recommended that the electrode locations be measured as described. The scalp must be prepared before an electrode can be fixed. This involves slightly abrading the skin to remove dead skin, sweat and other contaminants to the EEG signal. Scoop up a small quantity of NuPrep™ skin prepping gel on a cotton swab or tissue. With the thumb and index finger of one hand, separate the hair around the electrode site that was previously found and marked. Run the gel in the direction of the natural line formed along the scalp by the split hair. Some light force must be used, enough to redden the scalp slightly, but not enough to break the skin. Wipe away the excess prepping gel with a dry, lint-free cloth. Care should be taken to keep the hair parted and to keep track of the site after wiping clean.Helpful trick: A small amount of Ten20™ Conductive paste should be smeared on the newly prepared site. This has the combined effect of keeping track of the site, keeping the hair neatly out of the way, and acting as a landing pad for the electrode once it is ready to fix. Fill the electrode cup with Ten20™ conductive paste so that no air bubbles exist in the cup. Add more Ten20 paste onto the cup electrode, just enough to form a ball on the cup, not so much that it spills over the edge. Shown is the ideal amount of paste. Place the cup face down on the landing pad previously prepared. Gently push the electrode down to fix it to the scalp. A little bit of paste should run out along the edge of the cup to form a thin ring around it.Helpful trick: Place the electrode so that the direction of the cable does not place undue stress on the cup (so that it gets pulled, lifted or twisted off). The cable should hang naturally and towards the plastic clip (as shown). Leave enough slack in the cable to allow for comfortable head movement as well. Repeat the above preparation and placement steps on the ear lobes. Do not put too much paste on the ear clip electrode, but ensure that the gold disc is completely covered. Leave enough slack in the cable to allow the subject to turn their head easily, but not too much that it can get caught. Think about the angle of the cable from the ear clip to the neck clip, so that no extra tension is placed on the ear clip. Note the position of the clip, the direction of the cables and the slack left to provide mobility. H.H. Jasper, “The ten-twenty electrode system of the International Federation”, Electroencephalography and Clinical Neurophysiology, vol. 10, pp. 370-375, 1958. The EEG sensor is designed to coexist with other Thought Technology bio potential sensors such as T9306M(or T9307M) EKG sensor, T9303M MyoScan sensor, T7680 EEG-Z3 sensor, or SA9309M Skin Conductance sensor. To ensure correct EEG sensor operation, if sensors from another manufacturer are in the same electrical circuit and connected to the same subject, their electrodes must function at a voltage within the specified operating bias range, 1.0 to 3.0 volts above sensor ground. To check whether another sensor is interfering with the EEG sensor operation, connect and disconnect the other sensor from the subject, and note whether this causes a change in the EEG sensor signal level, or whether connection of the other sensor appears to cause any signal artifacts in the EEG signal. The nominal supply voltage for this sensor is 7.26V. The sensor can safely be used with a supply voltage of up to 9V. However, as the sensor is calibrated with a 7.26V supply voltage level, changes in gain and offset may be expected when operating at a different supply voltage level, changes in gain and offset may be expected when operating at a different supply voltage. The highpass effect of the sensor’s AC coupling is not shown in the transfer function. The function is accurate for frequency components within the specified bandwidth, and should adequately represent the scaling of an EEG signal. The 2.8 volt term is present if the TT Sensor Isolator is used. It is absent, if the sensor is directly connected to a data acquisition card, and if a resistor is connected across its output (see section below). This kit allows users to make either monopolar or bipolar single channel measurements. For connection of three standard DIN terminated.